Have you have dropped your iPhone 5c and have damaged the rear plastic case, or perhaps the casing is starting to look worn and is losing its glossy look? Then our expert iPhone technicians are able to help. We will remove your old damaged case and replace it with a brand new Apple iPhone 5c rear case. * Our normal repair turnaround times are 3 - 10 working days unless parts are to be ordered. We always aim to complete repairs as fast as possible. This is an in-house Apple iPhone 5c repair service, when ordering this service you are required to ship your iPhone into our repair centre for works to be undertaken. 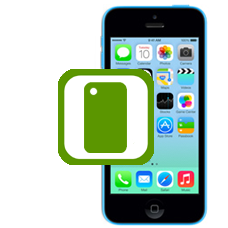 We can install any colored rear case in the iPhone 5c range to your iPhone. All our repair services include fully insured return shipping and VAT, however you have to pay shipping to send the iPhone to us.